Getting to and from Cripple Creek from Colorado Springs, Woodland Park and Divide is a cinch, with several shuttles running daily. 7:00 a.m. – 11:00 p.m. with a driver lunch hour from 8:00 p.m. – 9:00 p.m.
7:00 a.m. – 10:30 p.m. with a driver lunch from 8:00 p.m. – 9:00 p.m. This shuttle is equipped with a wheel chair lift. The shuttle will take you anywhere in town, to and from casinos, to and from hotels, and more. 20 minutes’ notice is strongly encouraged. 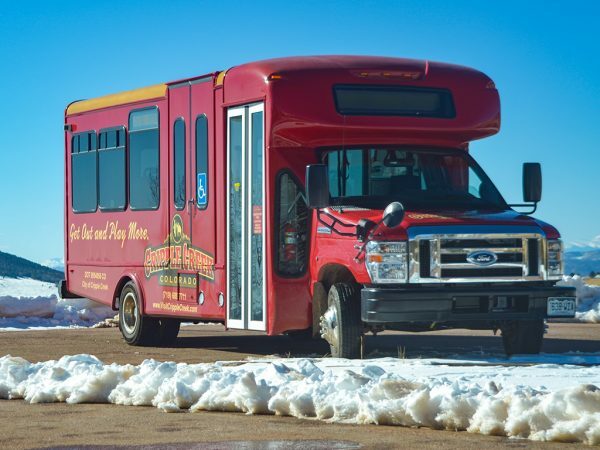 Cost to ride the City of Cripple Creek’s shuttle is $1.00 per person; Children 12 and under will ride for free if they are accompanied by an adult. If they are alone, the cost is $1. 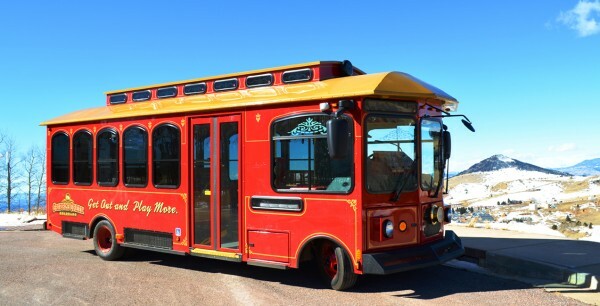 Cripple Creek Pick-Up Location: The Aspen Mine Center at 166 E. Bennett Ave.
May 15 – October 15: 6:30 a.m., 11:15 a.m., 2:15 p.m., 5:15 p.m.
On Saturdays and Sundays, the shuttle will not be running the 6:30 a.m.
On Fridays and Saturdays, there will be a run at 11:45 p.m.
October 16 – May 14: 11:15 a.m., 2:15 p.m., 5:15 p.m., 10:45 p.m.
May 15 – October 15: 6:45 a.m., 11:30 a.m., 2:30 p.m., 5:30 p.m.
On Saturdays and Sundays, the shuttle will not be running the 6:45 a.m.
On Fridays and Saturdays, there will be a run at midnight. October 16 – May 14: 11:30 a.m., 2:30 p.m., 5:30 p.m., 11:00 p.m. Cost is $1 – Round trip for unaccompanied children who are not attending a school event. The Gold Camp Connector is a public transit service that is funded by the City of Cripple Creek, the City of Victor, local casinos, the Cripple Creek and Victor Gold Mining Company and the Federal Transit Assistance Program administered by the Colorado Department of Transportation, Division of Transit/Rail. Vehicles are wheelchair accessible and operated in compliance with the Americans with Disabilities Act. In accordance with the Civil Rights Act of 1964, this service provider does not discriminate on the basis of disability, race, color, national origin or gender. Vehicles with lifts are available. To avoid a possible delay, please call (719) 689-3753 with any special needs. Saturdays & Sundays – 11:00 a.m. – 8:00 p.m. Hours are subject to change. Please see trolley stop business for details. Sit back, relax, and enjoy the scenery aboard our luxury motor coaches. Ramblin Express has provided service to casino patrons and casino employees since 1993, with an impeccable safety record. Daily departures from Colorado Springs, Woodland Park, Divide and Pueblo. For schedules, fares, information or to buy your tickets online, visit CasinoShuttle.com. Grab a Player’s Card from the Wildwood Hotel & Casino to take advantage of this free perk. Every Friday and Saturday, Wildwood buses will depart from Borriello Brothers at 229 South 8th Street in Colorado Springs. Leave Colorado Springs: 10 a.m.
Leave Cripple Creek: 11:30 a.m.
Leave Colorado Springs: 1 p.m.
Leave Cripple Creek: 2:30 p.m.
Leave Colorado Springs: 4 p.m.
Leave Cripple Creek: 5:30 p.m.
Leave Colorado Springs: 7 pm. Leave Cripple Creek: 8:30 p.m.
Leave Colorado Springs: 10 p.m.
Leave Cripple Creek: 12:30 a.m. Many other casinos offer free shuttles for their club members. Contact the casinos for more details.